The latest announcements from GTC18. Boston are pleased to bring you the first new product announcements from #GTC18. Speak to Boston today to schedule your full technology update. 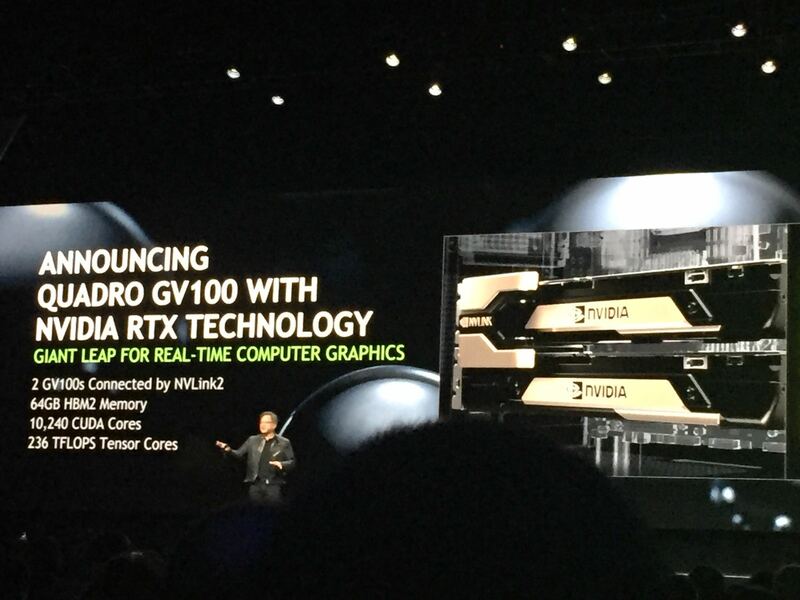 "The biggest advance in computer graphics since the introduction of programmable shaders nearly two decades ago, NVIDIA RTX — when combined with the powerful Quadro GV100 GPU — makes computationally intensive ray tracing possible in real time when running professional design and content creation applications. "The Quadro GV100 GPU, with 32GB of memory, scalable to 64GB with multiple Quadro GPUs using NVIDIA NVLink™ interconnect technology, is the highest-performance platform available for these applications. Based on NVIDIA’s Volta GPU architecture, the GV100 packs 7.4 teraflops of double-precision, 14.8 teraflops of single-precision and 118.5 teraflops of deep learning performance. And the NVIDIA OptiX™ AI-denoiser built into NVIDIA RTX delivers almost 100x the performance of CPUs for real-time, noise-free rendering." Now equipped with 32GB of memory, Tesla V100 GPUs will help data scientists train deeper and larger deep learning models that are more accurate than ever. They can also improve the performance of memory-constrained HPC applications by up to 50 percent compared with the previous 16GB version. Supermicro will be rolling out compatible servers in Q2 - Boston will of course keep all customers updated on the latest developments. Announcing DGX-2, the world's most powerful AI system for the most complex AI challenges. DGX-2, the first 2 petaFLOP deep learning system, delivers 10X performance gain, driven by the new Tesla V100 32GB GPU and NVSwitch. "NVIDIA’s new DGX-2 system reached the two petaflop milestone by drawing from a wide range of industry-leading technology advances developed by NVIDIA at all levels of the computing stack. DGX-2 can train FAIRSeq, a state-of-the-art neural machine translation model, in less than two days — a 10x improvement in performance from the DGX-1 with Volta, introduced in September."